Car sales, a key indicator of the economy, continued to remain tepid in January due to poor demand. This was a result of high fuel price and insurance costs. Manufacturers, too, dispatched slowly to correct high inventory at dealerships. 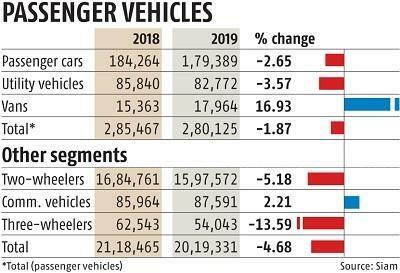 Data from the Society of Indian Automobile Manufacturers (Siam), released on Friday, showed passenger vehicles (PVs), the most valuable segment of the domestic automobile industry by revenue, reported a decline of 1.87 per cent in sales in January. This is the sixth month since July 2018 that has had a decline. Overall, the auto industry’s domestic sales also registered a decline of 4.68 per cent, touching 2.01 million units in January. In the same period last year, it had sold 2.12 million units. Even within the PV segment, dispatch of cars declined 0.94 per cent to 233,856 units. 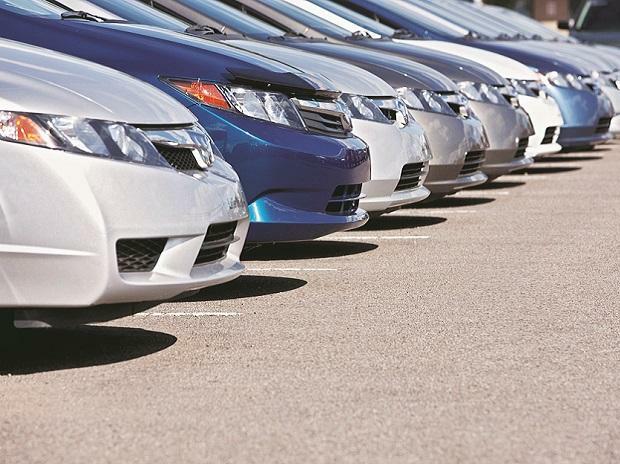 Sale of utility vehicles also slipped by 3.5 per cent, to 82,772 units. Vans, the smallest segment of PV, grew 16 per cent to 17,964 units. With low festive sales, stocks at dealer outlets also went up considerably. As a result, carmakers have slowed supply. An executive with a leading carmaker said with reduced dispatches and discount-driven brisk retail sales during the month, the situation is now normal. Inventory levels reduced to 30-35 days from the earlier levels of 45-50 days. “Issues such as high fuel prices, lack of finance, and credit options led to a decline in sales in the third quarter,” he said. The executive said, “With fuel prices coming down, buyer sentiments have now started to turn positive and we expect the remaining year to be better in terms of sales.” He said 2019 would be a “year of growth”. According to Siam, total two-wheeler sales in January fell 5.18 per cent to 1.59 million units, compared to 1.7 million in January last year. Motorcycle sales fell 2.55 per cent to 1.02 million units. Scooter sales declined 10.21 per cent to 497,169 units, compared with 553,695 units in January 2018. Sales of commercial vehicles, however, grew 2.21 per cent to 87,591 units in January. Dispatches of light commercial vehicles grew 5.21 per cent to 59,773 units. Sales of three-wheelers slipped 13.59 per cent to 54,043 units.